A 52 year old male from central Pennsylvania presented with a mysterious, multi-system and progressive illness which began 10 years ago. It began with flu-like symptoms, burning eyes, abdominal pain and persistent elevation of white blood cell count. He later developed severe muscle and joint pain, especially involving the lumbar spine. Eight years ago, based on recommendations from Hopkins, he had extensive spinal surgery including an anterior fusion of his lumbar spine. Afterwards the pain intensified and become unbearable.He has been unable to sleep in a bed, only a recliner ever since. Of interest, a local orthopedist in his community told him should not have the surgery. When he discussed the divergence of opinion with has family doctor he was told, "Who are you going to believe? Hopkins of course." Apparently God ("The John") is not always right. He is now a regular patron of a pain management clinic which readily doles out copious amounts of opiods -- which are ineffective, for this intractable pain. He now suffers with severe, abdominal pain, unremitting daily headaches and diffuse spinal pain which has spread to his cervical spine. He has hand pain and swelling, numbness and tingling and burning sensations in his hands. He complains of "charlie horses" in his legs, twitching muscles, disrupted sleep, cognitive decline with memory loss, progressive weakness, frequent urination with a recent diagnosis of prostatitis given, loose stools, an lack of energy and of course profound fatigue. The review of systems was significantly positive for shortness of breath and night sweats. Prior to our meeting he had been treated by another doctor for 18 months with IV Rocephin. The only treatment has been Rocephin. The physician gradually tapered the dose and frequency of the IV medicine. The doctor told him he (the doctor) understood Lyme disease because a family member had suffered with the illness. The patient was never treated with other antibiotics and never treated for co-infections.The Rocephin had provided a modicum of relief. When this was abruptly stopped (because he had enough treatment) -- he knew the plug had been pulled and he found himself circling around the drain. He was referred by one of my patients. Blood work for coinfections previously was limited. New testing showed a Babesia duncani or WA1 titer of 512. His Lyme WB testing from Stony Brook yielded interesting results. The IgM was called negative with bands: 18, 25, 28, 31, 66, 72 and 93. The IgG was reported as indeterminate with band 41 and 58 present only. His blood smear is shown above. My elaborate discussions of West Blots can be found elsewhere. This patient relayed (incorrect) information given to him by his doctor -- I hear the same mantra every day: " My doctor(s) told that one type of antibody shows new infection (IgM I think_) and other shows old infection - I forget which is which." "The doctors said I most have been bittern again and have a new infection." Newsflash: Lyme does not play by those rules. See my last Blog. There is difference between a doctor being Lyme aware and a doctor knowing how to treat Lyme disease. The Lyme was not treated adequately with the appropriate "cocktails" and Babesia, in this case -- florid, dangerous infection - easily diagnosable, was entirely missed. Few doctors are able to set up a CLIA approved labs and do Giemsa smears, but a simple antibody test through Labcorp was positive. When patients ask me if I am a Lyme Literate Medical Doctor my answer is: "Are you a Lyme literate patient? this is what is important." Unfortunately there is no official certification for a specialty which is not officially acknowledged to exist. The term LLMD has no real meaning. Anyone can use it. Patients have to be their own advocates and know as much about the disease as possible. Learning about the disease is daunting under the best of circumstances and impossible for most patients suffering with"Lyme brains." Nonetheless, keep plugging away. Hopefully a friend, family member or spouse can be helpful. The IgM question, is it chronic Lyme? Revisited. I have been blogging since 2008. To date the most popular page views is “The IgM question, is it chronic Lyme.” Updated post 12/27/17 with additional information. I re-read my entry, 1/15/18. The post has been updated. A study by Aucott, JHH shows that a subset of patient, those destined for chronic illness, make a poor IgM response to infection and incapable of IgG class switching. This is discussed elsewhere. Many patients I see have been told by their physicians that the IgM results on a Western Blot test indicate only recent infection; and many of these patients have been told that their positive Lyme test was a false positive when the expected IgG bands did not appear. This is not surprising. This conclusion corresponds with statements made by the IDSA and CDC. These groups (CDC/IDSA) admit recommended test lack sensitivity in early Lyme disease but claim their two-tier test is 99% accurate in late disease, at which time the requisite 5/10 IgG antibody bands will reliably appear. In the usual course of events when our bodies are exposed to pathological infectious agents oour immune system first makes IgM antibodies; but after a period of days or weeks the relatively ineffective IgM antibodies are supplanted by the more effective IgG antibodies. But as I frequently explain to my patients: Lyme does not play by these rules. There is much that controversial about this disease and some of the controversies are legitimate. The IDSA/CDC statements about antibody responses associated with Lyme disease are completely false and should be expunged from the controversy. The immunological responses seen in Lyme disease, in all stages of the disease show a predominant IgM antibody response and a poor IgG response in the majority of cases. Of course there are exceptions to this rule. In general, overall production of antibodies of either class in response to infection may be quite poor. Why this occurs I do not know. The immune system is incredibly complex and scientist are learning more about it every day. There is an interplay between invading germs and immune responses. These relationships are different with every single pathogenic germ. With Lyme disease, it has been widely reported that infection causes down-regulation of cytokines and inactivation of complement fixation as a mechanism for survival. Both IgM and IgG antibodies are made by the same B lymphocytes and plasma cells. These cells which manufacture antibodies receive signals from specialized proteins and cytokines which leads to change in DNA transcription and the manufacture of the new class of antibodies. This is referred to as class switching. Defects in this switching mechanism have been described in both genetic and acquired diseases. It is not difficult to imagine that infection with Lyme somehow influences this switching mechanism so that IgM antibodies are favored. If this is correct, it may underlie a novel mechanism of immunosuppression. Of course many practitioners see Lyme disease, chronic infection with Borrelia burgdorferi species and strains, as an immune suppressed state in the host or patient. I am looking at a patient laboratory report from Stony Brook University Medical Ctr., Lyme Disease laboratory, Western blot results are: IgM bands, 18, 23, 25, 31, 41, 64 and 93. The IgG Western Blot strips to appear identical to the control. No bands are identified. If I was of the IDSA ilk I might conclude this test shows serological evidence of acute Lyme infection only. I would have a hard time explaining the 31 band. The 31 band represents a reaction with outer surface protein A (OspA). This particular antigen is expressed in the gut of the Ixodes tick, disappears in the salivary glands before the spirochetes are injected into the host and does not reappear in the host for at least six months. If I was of the IDSA persuasion I would have to call the 31 band a false positive. Otherwise the results would make no sense. There are two problems with this resolution. First, this reaction is highly specific -- this protein is found only on the surface of Borrelia burgdorferi thus false positives would be unexpected; and -- second, these results are from one of the country’s top Lyme disease laboratories whose credentials are unimpeachable. But luckily I am not of the IDSA persuasion. Because I know that only IgM antibodies or a predominance of IgM antibodies are frequently seen in patients with chronic Lyme disease. This patient has been sick with Lyme disease since 1988 at which time she presented with Bell’s palsy and acute meningitis. These lab results are from two weeks ago. She has been treated for chronic Lyme disease by several physicians for more than two decades with a variety of intravenous and oral antibiotics. She has many unresolved chronic symptoms but is able to function reasonably well. She becomes disabled with severe relapses whenever antibiotics have been discontinued. The use of long-term antibody therapy allows for some reasonable quality of life. Without access to antibiotics her quality of life would be zilch. The answer to the question: can IgM antibodies alone are seen in chronic Lyme is clearly yes. It is frequently argued by the IDSA that Lyme disease must act in a particular way or test in a particular way because there are no precedents in nature to backup contentions to the contrary. This thesis is specious. According to the CDC, tuberculosis is one of the deadliest diseases and infects one third of the world’s population. An awful lot of research is been done over many years looking for antibody test to help physicians diagnose this infection. To date, none has been found. ( lymphocyte transformation test available -- imperfect test) 90% of patients infected with tuberculosis produce antibodies. The specific antibodies produced vary from patient to patient in ways that are impossible to predict. After decades of research there is no antibody test for tuberculosis with a sensitivity greater than 20%. Tuberculosis which is usually localized to the lungs, requires treatment with several antimicrobials for numerous months and relapses may occur. According to the CDC, patients with Q fever causing cardiac involvement need treatment with two antibiotics for at least six months. According to the CDC advanced cases of brucellosis may require treatment for six months with dual antibiotic therapy. Many infectious diseases are entirely unique and without precedents in nature. Lyme disease is different from other infectious diseases in numerous ways. One of those ways is that infection tends to be associated with production of IgM antibodies and not IgG antibodies. An investigation into this anomaly should be fertile ground for future research. Older studies, Steere et. al, show that IgM antibodies may be present many years after acute infection with Lyme. The 25-year-old female recently came to my office for evaluation of new onset chronic daily headache. This unfortunate young woman had been suffering with headaches every single day of her life the last 18 months. Historically, the problem began shortly after she returned from a camping trip in Ocean City Maryland. Upon returning home she had a sudden headache, mild flulike symptoms, fatigue and malaise. The headache is always right-sided in the temporal-parietal area. She uniquely described her headache is having a ram’s horn pattern of distribution describing a spiral pattern of pain. The pain was described is having a squeezing quality, not throbbing, associated with nausea at times. Pain intensity increases around time of menses. One year prior to our initial consultation she been tested for Lyme disease. She had a positive EIA and 2/3 IgM Western Blot bands meeting the CDC criteria for a positive surveillance test. She was treated with doxycycline for 4 weeks which had no impact on the headaches. Her neurologist informed her that Lyme disease not relevant to her condition and an infectious disease specialist felt that she been adequately treated for Lyme disease and that this had been excluded as a cause of her headaches. She was prescribed a large number medications sequentially including: Topamax, Neurontin, Imitrex, Fioricet and many others none of which had any efficacy whatsoever. The physical examination was completely normal except for subtle sensory deficits. Her ability to sense a cold object, in this case a metal tuning fork, was diminished in the hands and feet. This finding is generally dismissed by most neurologist as insignificant. In my experience, this finding is reliably present in at least 80% of my patients diagnosed with Lyme disease and is rarely present in healthy persons. The remainder of her workup was unremarkable until I came to the blood smear. Here I documented a red blood cell filled with small stained inclusions compatible with bacteria. A photo image is included here. Bartonella species are perhaps the most frequent coinfecting organisms in patients with Lyme borreliosis. (Yes this contradicts my last blog). In the 2012 paper entitled “Bartonella spp. Bacteremia and Rheumatic Symptoms in Patients from Lyme Disease- endemic Region,” published in the CDC Journal: Emerging Infectious Diseases, findings from Dr. Mozayeni’s practice are described. Among 296 patients suffering with, Lyme disease, joint pain, chronic fatigue syndrome and fibromyalgia, 62% were found have Bartonella species antibodies. These species of Bartonella included: B henselae, B. Koehlerae, B. vinsonii subsp berhoffi and others designated Bartonella spp. Prior to 1990 there were only two named species of Bartonella. Now there at least 24 named species of Bartonella and numerous yet unnamed species in the queue whose DNA signatures have been deposited in Gen Bank. 17 Bartonella species are now associated with an expanding spectrum of human illness. Bartonella species are fastidious, gram-negative bacteria with demonstrated affinity for intracellular localization in red blood cells and endothelial cells. Bartonella is the only genus of bacteria known to induce pathological angiogenesis (growth of new blood vessels). This may be associated with elevated serum levels of VGEF (vascular endothelial growth factor). In 2013 Maggi et al report the ability of Bartonella henselae to invade human brain vascular pericytes. Pericytes are small cells cells that surround endothelial cells and are an important constituent of the blood brain barrier. Blood smears may suggest the presence of Bartonella. The diagnosis may be confirmed by PCR testing. For clinical purposes this may not be necessary. This patient was treated with Zithromax, rifampin and Tindamax. Combination rifampin with Zithromax is known clinically to be very effective against Bartonella species. Within four weeks of treatment the headache was completely abolished. However, the symptoms returned within 5 days when the medication was discontinued by the patient and were once again abolished when the medication was reinstated. After 3 months on continuous antibiotic therapy the patient remains symptom free. This patient’s case demonstrates new onset chronic daily headache in a patient with newly acquired Lyme disease associated with coinfection with human bartonellosis with an excellent clinical response using targeted therapy. Correction: Bartonella species are rarely seen within red blood cells. The Giemsa smear most like shows a reticulocyte, an immature red blood cell and not Bartonella. The diagnosis is usually clinical. This 38-year-old female came to see me because an aunt that she is fond of told her she has Lyme disease. She has a variety of symptoms which have been progressively getting worse. She thinks symptoms for started about three years ago but her state of health has been declining precipitously over the last three months. Recent symptoms included migratory joint pain involving a wide range of joint: axial joins including neck and spine; large joints including shoulders hips and knees, medium sized joints including the elbows wrists and ankles and small joints including hands, feet and toes. Her hands become swollen and inflamed at times. Other symptoms include: profound fatigue, lack of endurance, progressive cognitive dysfunction, headache, numbness and tingling and a persistent cough. She has had an unusual persistent dry cough. She has experienced severely disrupted sleep inclusive of episodes of sleep paralysis which have been extraordinarily frightening. She has a history of spending a lot of time outdoors hiking but has no specific history of tick bite, rash or summer flu. Her workup showed Lyme seronegativity. From Labcorp not one band out of the 13 measured was present. The C6 peptide level was 0.35. Lyme Western Blots from so Stony Brook showed IgM bands 41, 20 and 93 and IgG bands 41 and 64. 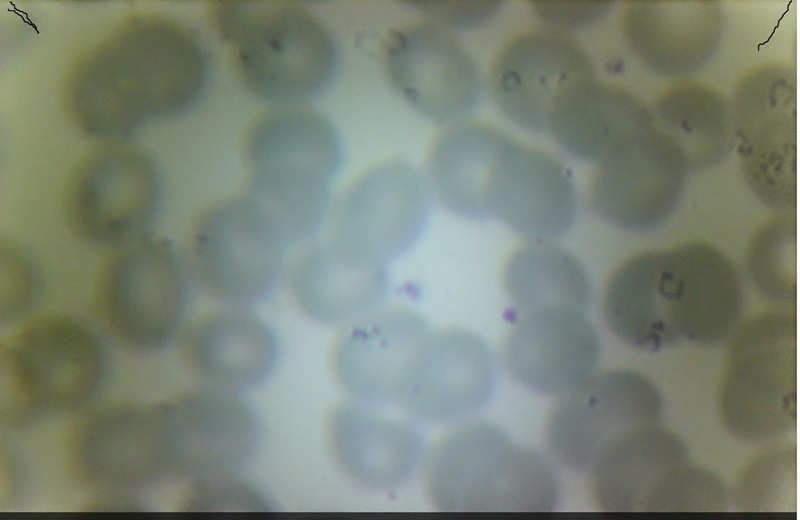 Antibody testsing for Babesia duncani was positive with the titer of 1:512. When I saw the patient on the next visit to go over her labs, when pressed, she did admit to having classic air hunger. I recall one patient who very clearly always knew when Babesia was becoming issue because of a recurring dry cough. Okay, I think are test do show evidence of exposure to Lyme disease. I think I have come to understand why C6 peptide tests are not elevated more often than we see. The C6 peptide antibody tests is supposed to combine both IgM and IgG responses but primarily only represents IgG responses. I will reiterate here that Lyme disease in the vast majority of cases causes primarily IgM antibody responses irrespective of the stage of illness. The C6 antigen is so highly specific for Borrelia burgdorferi that cross-reactivity is really not an issue. There can be some mild nonspecific reactivity called background noise. Basically, any number greater than 0.1 is suspect for exposure. For example, I am currently seeing a patient whose C6 peptide went from undetectable to 0.15 after course of treatment and I think this could be a surrogate for seroconversion. Based on my research and experience I am pretty comfortable with the notion that C6 peptide levels of .3 or greater are evidence of prior exposure to Borrelia burgdorferi. These (Stony Brook) Western blots would have been graded positive if they had been obtained at IgeneX based on internal criteria. The 93 band is considered highly specific. Moreover, the 20 band and other markers in the low 20s probably represent Outer Surface Protein C variant reactions which are also highly specific. These reactions are not elicited with other Lyme Western blots available commercially. But back to the cough. Air hunger, a sensation of not being able to get in enough oxygen when taking a breath seems to be a reliable indicator of babesiosis. I have never really understood why. I came across a paper published in the journal parasitology in 1999 which may offer an explanation. Hemmer et al reported “ Endothelial cell wall changes, pulmonary edema and respiratory distress in mice infected with the WA1 human Babesia parasite.” In mice experimentally infected with Babesia microti no pulmonary changes were detected. The B. duncani infected mice had severe pulmonary lesions. ( Most of us are not mice but these models may be usefull). I think Babesia duncani is underappreciated. Please recall, a study in 2011 found nearly a third of patients tested for Lyme disease and co-infections at one laboratory were positive for Babesia duncani or WA1. Most of the positive reactions (I use Labcorp) report the lowest titer considered positive, 1:256. Some people have suggested that some of these are false positives or perhaps represents cross-reactivity with some other protozoan. I do not think so. You have to remember that a patient's serum has been diluted eight times to achieve a titer of 1:256. Perhaps unreported titers of 1:128 or even lower may also be evidence of infection. Certainly I have seen patients seroconvert. One patient with dramatic symptoms and a floridly positive blood smear went from a zero titer to a titer of 1024 after some treatment. I am now convinced that B. duncani is the predominant co-infection seen in patients with Lyme Borreliosis. I think this has not yet been widely reported because to date this organism has not been widely tested for. Even now, many physicians habitually test only for B. microti. It does appear that serological assays from Labcorp or Quest are reasonably accurate. For confirmation a blood smear or FISH test can be added. I think this diagnosis can more frequently be supported by solid evidence than is widely acknowledged. 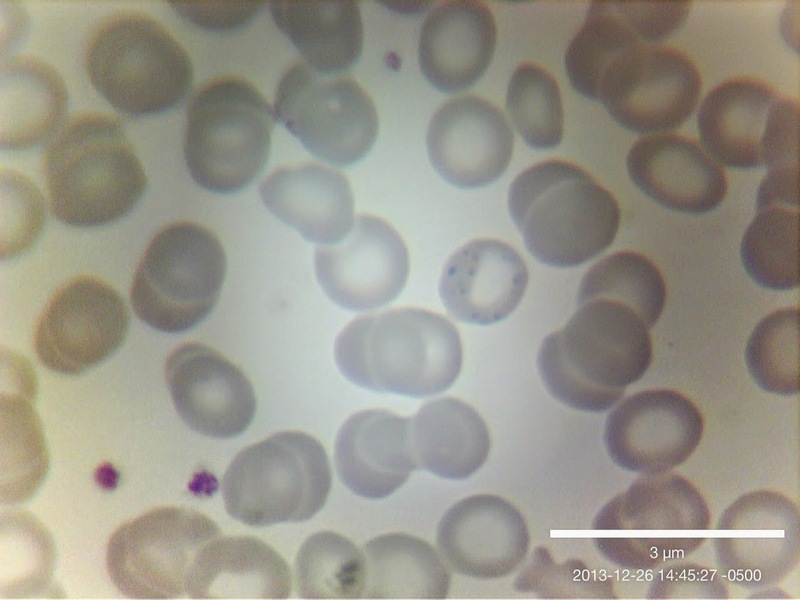 Babesia microti is relatively rare in comparison to B duncani and other species of Babesia associated human disease such as MO1 and CA1 are probably uncommon. Although is not the usual presenting symptom, a dry cough along with other pulmonary symptoms can be a marker for human babesiosis. It is worthwhile to note that seroconversion of babesiosis can occur just as it may with Lyme borreliosis. Once again we must face the reality that serological testing for Lyme disease is abysmal. Back to the patient. My clinical diagnosis is supported by diagnostic testing and the patient and I have a clear understanding of where we need to go to make her better.